Like a persistently overlooked but deeply capable younger sibling, preheader text has been overshadowed by the subject line for too long. To recap, a preheader is the text that comes after the subject line when an email is viewed in your inbox. It's often used to: give your recipient a taste of what’s inside the body of your email; include key information you don't want them to miss.. or just include useful brand details, such as store address. Research from Demandware has predicted that consumers across the globe will receive “nearly 99 billion emails each day from marketers this year”. Worse still (cue the sad violins) the majority of these emails will be “completely irrelevant to the recipient, and will be ignored”. As experts in email, why are we telling you this? Because we want to drive home that, in 2018, marketers need to utilise every single component of an email campaign if they want to stand out from the crowd and boost open-rates—including the often neglected preheader text. That's why we’ve taken a break from subject line hacks and email copy tips to explore some useful best practices when it comes to nailing email preheader text. Always think about your email’s preheader in conjunction with its subject line, and vice versa. Reason being, the two sit side by side in an inbox, and are therefore registered in a recipient's mind in relation to one another. These two components are a team, therefore need to work together to pique subscribers' interest and get your email opened. Aside from complementing the subject line, it’s important to remember that preheader text is lifted from the initial copy of your email and will therefore also display at the top of your campaign. Consequently, the message of your preheader should make sense in both contexts. If you want your preheader text to be unique from your email copy, don’t panic; there are ways to make sure this text is no longer visible once the email has been opened. (Ways to do this include HTML and CSS hacks, or even matching the colour of the text with the email's background colour to make it invisible. Read more about this by checking out this Litmus post). 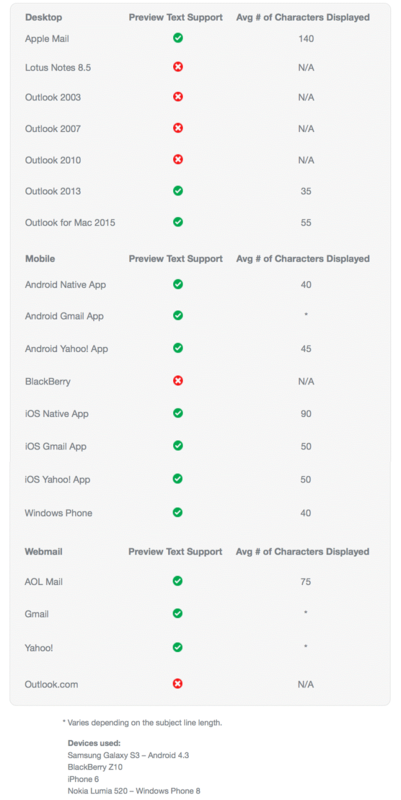 The other thing to remember is that each of your email subscribers will see different lengths of your preview text according to the device and email client being used. For example, somebody using Outlook on a Samsung might see a different amount of text to someone using Gmail on an iPhone. If you’re not sure how many characters you can use for a preheader, Email on Acid recommends around 50-100 characters as a safe bet. If you want your preheader to be particularly long or short, note that the length of a subject line alters the length of a preheader. So if you want your preheader to be short, try elaborating your subject line. Try out the following recommendations (if you're not already) to see if they manage to take your open-rate up a notch. As Litmus points out, preview text can be a useful way to influence behaviour; for example, “getting subscribers to scroll and click specific articles mentioned in the text”. It sounds obvious, but using preheader text to outright tell recipients to open your email, buy your products or check out your content can actually work. Here's a solid example of this in action from Japanese lifewear brand Uniqlo. If your brand has a fantastic discount available to its customers, you can use the preheader text as a way to advertise this and (hopefully) encourage not just an email open but also a purchase. Let your subscribers know that any offers promoted in your email's subject line have a time limit and cannot be taken for granted. This should give any tempted buyers the nudge they need to take action. What makes your brand different? Use your preheader as an opportunity to illustrate what your brand stands for in a seamless, succinct way. If your brand values appeal to a recipient, this will make them more interested in your brand as a whole and want to hear what your email has to say. If your know that your email contains valuable, well-researched content that will benefit a recipient, your preheader is a good place to shout about it and spread the word. Love them or hate them, emojis are still an obsession. Like the subject line, preheader text can be enhanced with a simple emoji - in this case, clapping hands - as it is a guaranteed way to grab a subscriber's attention. Take note, emojis are a great accompaniment to fun, creative copy that shows a bit of imagination. "You chase something, it runs away." Being a bit cryptic is a tried and tested way of driving intrigue and curiosity, making a recipient want to find out more. Is this subheading displaying properly? Many preheaders are used as a way to ensure a subscriber is able to view the email online if the display isn’t working properly. Preheaders such as “Having trouble viewing this email?” or “View this email in a web browser here” are rife in the marketing industry. However, how effective are they? Whilst they are undoubtedly useful on a practical level, do they really generate any sense of curiosity to prompt a recipient to actually open the email and read what’s inside? We're not so sure..
Sermon over! We hope this post has really brought home how much potential the overlooked sibling of email marketing has. Preheader text has the ability to increase open-rates and drive engagement, so don't miss out on this low-hanging fruit. If we've missed any game-changing pieces of preheader advice, leave us a comment below!